Robert Klimasewski, chairman of VirtualScopics Inc., has been a staunch supporter of the University of Rochester. He is a member of the Hajim School Dean's Advisory Committee, and previously served as a member of the School of Engineering and Applied Sciences Visiting Committee for 16 years. He was also a member of the Trustees' Alumni Council of the College. Klimasewski also is a major supporter of the Skalny Center for Polish and Central European Studies and is a member of the George Eastman Circle. He earned his BS in engineering in 1966 and MS in optics in 1967 from the University of Rochester. Bob played baseball and football while attending Rochester and was inducted into the UR Sports Hall of Fame in 1995. Two of Bob's sons are Rochester alumni. VirtualScopics makes medical imaging analysis tools that assist clinical researchers in accelerating the drug development process. 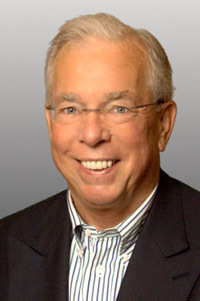 Previously, he was president and CEO of Transcat Inc., and Co-Founder and Vice Chairman of Burleigh Instruments, Inc.
Bob received the Armstrong Alumni Service Award at the University of Rochester in 2006 and the Distinguished Alumni Award from the School of Engineering and Applied Sciences in 1993. He resides in Honeoye Falls, NY.